Proposition QQ will be on the Nov. 6 ballot. 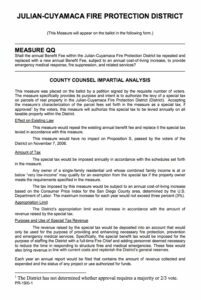 This is a citizens initiative to raise the annual Julian-Cuyamaca Fire Protection District benefit fee to $200 from $50. Proponents believe that a simple majority vote is required to pass this measure. Currently, three JCFPD board members (Jack Shelver, Aida Tucker and Kirsten Starlin) are pursuing dissolution of the 34-year-old volunteer fire department. They have already prevented a referendum to rescind their resolution to dissolve from being on the November ballot. They “inadvertently” failed to follow Elections Code and place the citizens initiative on the ballot — requiring a last-minute ex parte hearing to order the registrar to place the initiative on the ballot. Two other board members (Brian Kramer and Buddy Seifert) are opposed to dissolution and in favor of the citizens initiative. This is a separate fight that will require LAFCO protest petitions, and we feel confident we will win that one. We will force LAFCO to place the issue of dissolution on the ballot in a special election, and that will require a majority vote to stop that process. But we still need to increase the revenue for our fire department; hence, we need the citizens initiative to pass. In June, San Francisco had two propositions on the ballot. 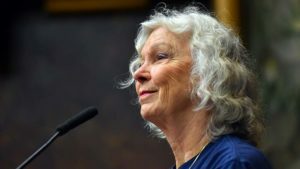 One of them, proposed by the city, required two-thirds approval vote and failed. The other, Proposition C, was a citizens initiative and it passed by 50.87%. The City of San Francisco certified the citizens initiative. This is the test case that could determine our fate as well as that of San Francisco. The Howard Jarvis Taxpayers Association is suing San Francisco to overturn Proposition C (the S.F. citizens initiative). It will probably go back to the California Supreme Court for clarification. I am a proponent of the Julian initiative, along with a retired firefighter and a paramedic in my town. We are most certainly “citizens,” and the JCFPD board had nothing to do with the initiative. And this whole process has been done without legal representation. While the City of San Francisco has the resources to fight in court, we in Julian are on our own with no major supporter or financial resources. We are relying on the success of the City of San Francisco to make precedent and support our cause. Patricia Landis of Julian is founder of the nonprofit group Julian Fire Plugs, which raises money for the town’s volunteer fire department.